Yupo paper is made of 100% polypropylene with a neutral pH and exceptionally smooth surface. It is waterproof, stain resistant and incredibly strong. It is ideal for various aqueous techniques as well as offset printing, silkscreen and debossing. 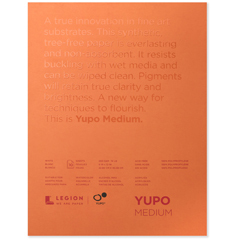 Opaque, medium weight YUPO available in a gummed-bound pad. White, smooth surface. 100% polypropylene. 197gsm. 10 sheets/pad. 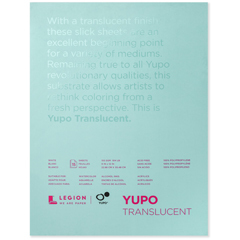 Translucent YUPO in a gummed-bound pad. Slightly lighter weight, and excellent translucency. 100% polypropylene. 153gsm. 15 sheets/pad. 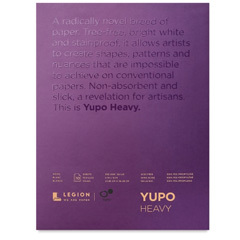 The heavyweight, 144 lb (390 gsm) paper in Yupo Heavyweight Pads is incredibly strong with a very smooth surface and a heavier weight. 10 sheets/pad.